To celebrate Telkomsel’s 14th anniversary this month, Indonesia’s sole iPhone 3G provider is cutting Rp. 1 million (approximately $96 at this writing) off both the 8GB and 16GB models, bringing the prices down to Rp. 2,999,000 ($289) and Rp. 3,999,000 ($386) with a 12-month contract. The timing of the promotion seem to coincide nicely with the rumored announcement of the third generation iPhone, but for those who are not aware of Apple’s supposed plans, this latest price drop may leave an unpleasant taste. Having launched the iPhone 3G barely two months ago, this is the second time Telkomsel has altered the price of the phone. Initially available at varying prices across three different plans, they evened the prices in early April to Rp. 3,999,000 for the 8GB and to Rp. 4,999,000 ($482) for the 16GB. Unlike with providers in some other countries, such as the U.S., Singapore, or Australia, Telkomsel only imposes a 12-month contract instead of a 24-month period, mainly due to local market’s unfamiliarity with this particular model of purchase, and possibly due to the proximity of a new iPhone release. In fact, aside from iPhone 3G customers, no such contract exists between the providers and the customers. It is only recently that RIM has started working with the three local telcos who offer BlackBerry services to lock customers to some sort of contract. Only a small number of wireless broadband customers are locked under contract to their respective providers. 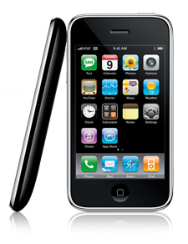 When Telkomsel announced iPhone 3G pre-order in January, roughly 39,000 people registered interest within the first month, but less than 6,000 actually purchased the iPhone when it was finally made available in late March, due to the confusion surrounding conditions and eligibilities. Those who were not existing Telkomsel customers or whose average bill was not at or above a certain amount could not buy an iPhone under contract and could not therefore take advantage of the more affordable pricing option. They were instead offered the ability to purchase iPhones at the pre-paid option, which meant bearing the full brunt of the cost upfront at Rp. 9.6 million ($926) for the 8GB iPhone and Rp. 11.2 million ($1081) for the 16GB model, including in both cases tax and 500MB of mobile data package per month for 12 months. With this anniversary promotion, the pre-paid option also received a million Rupiah price drop. The big question among Indonesian minds now is whether Telkomsel will offer the next iPhone model as soon as it is made available by Apple or whether they will make their customers wait several weeks to allow for the older iPhone 3G to fully run out.